After Chicago police Officer Dora Fontaine called out the lead detective into the Laquan McDonald shooting for allegedly fabricating statements and attributing them to her, she says some of her fellow officers turned against her. Fontaine is a key witness for special prosecutors in their case against Chicago Officer Thomas Gaffney, former officer Joseph Walsh and ex-Detective David March. Each of the men has been charged with conspiracy, official misconduct and obstruction of justice after they allegedly falsified reports from the scene of the shooting to “conceal the true facts” of McDonald’s death in 2014 in an attempt to shield fellow Officer Jason Van Dyke from prosecution. Fontaine’s testimony is key to the state’s case, as she alleged March instructed her to include false information in her incident report from the scene. Specifically, she said March told her to categorize the shooting as an aggravated assault against officers and list Van Dyke, Walsh and March as victims. Fontaine arrived on the shooting scene just before McDonald was shot and fell to the ground, she testified Wednesday, saying she never saw McDonald raise a knife he was carrying toward Van Dyke or make any “attacking” movements before the shooting. Despite that, March – the case’s lead investigator – allegedly attributed statements to the contrary in his report, saying Fontaine had seen McDonald make those motions. Defense attorney James McKay accused Fontaine of lying in order to save a job “she needs,” after several other officers involved in the shooting were stripped of their badges or recommended to be fired. “What kind of job would you get at your age with your job and your skill set if you got fired from the Chicago Police Department?” he asked, noting Fontaine now earns about $90,000 per year after working previously at a Popeye’s restaurant and a student loan job. He read off Fontaine’s sworn testimony from a 2016 interview with the city inspector general in which she said she had seen McDonald make “attacking” movements. A year earlier, Fontaine told FBI investigators under oath that she had seen McDonald “waving” the knife and moving closer to Van Dyke. Fontaine maintained she has always told the truth. Also testifying on Wednesday was Joseph McElligott, Gaffney’s partner of two years, who was the first to approach McDonald on the night of Oct. 20, 2014. He previously testified at Van Dyke’s trial and on Wednesday repeated details about his encounter with McDonald before the shooting, recounting how he told the teen to drop his knife 25 to 30 times and pursued him on foot before McDonald took off running toward South Pulaski Road. Gaffney, still inside his squad vehicle, also followed McDonald before the teen stabbed at the car, popping a tire and scratching its windshield. When asked if McElligott considered this a battery against his partner, the officer said no. McElligott was asked if he felt McDonald had used force “likely to cause great bodily injury or death.” He testified McDonald did use some force, but it was against the vehicle. That contradicts police report from the shooting, which stated McDonald had use such force against officers. Gaffney’s attorney, Will Fahy, suggested earlier this week his client had briefly considered shooting McDonald during this encounter, but decided against it. McElligott also recalled officers gathering at the police department’s Area Central headquarters to watch surveillance footage of the shooting from a nearby Dunkin’ Donuts before official reports were filed. He also remembered someone there making a statement about Van Dyke “backpedaling” before the shooting. Van Dyke initially claimed he had backpedaled but that was contradicted by video that showed Van Dyke walking toward McDonald during the shooting. Prosecutors believe these discussions show officers worked to create a narrative designed to help protect Van Dyke from prosecution. The defense spent much of the early afternoon trying to show the shooting itself was justified and that reports filled out after the fact by Walsh and Gaffney were necessary due to a quirk in the police department’s computer system rather than evidence of a cover-up. CPD Sgt. Larry Snelling, a 26-year department vet, testified at length about how and when officers are supposed to fill out two types of reports – tactical response reports (TRR) and officer battery reports (OBR). After reviewing dashcam footage of the shooting, Snelling said Van Dyke was the only officer who should have filed a TRR after the McDonald shooting, because he was the only one who actually fired his weapon. But Walsh and Gaffney also filled out TRRs. Prosecutors believe they did so in order to make it appear they had been battered by McDonald before his death. Their defense attorneys, however, said they only did so because they needed to file OBRs. In the department’s filing system, an officer who wants to fill out an OBR must first fill out a TRR, even if they didn’t use any force. Walsh and Gaffney claimed they were both victims of either a battery or an assault – which does not require any physical contact – at the hands of McDonald, thus they had to fill out both reports. McKay also highlighted Illinois use of force statutes, arguing that McDonald could have reasonably been considered an armed assailant after he attacked a truck driver with a knife and stabbed at Gaffney’s squad vehicle before the shooting. McKay claimed both these men were victims of at least an aggravated assault. The trial is set to resume Thursday morning. Below, updates from day two in the courtroom. 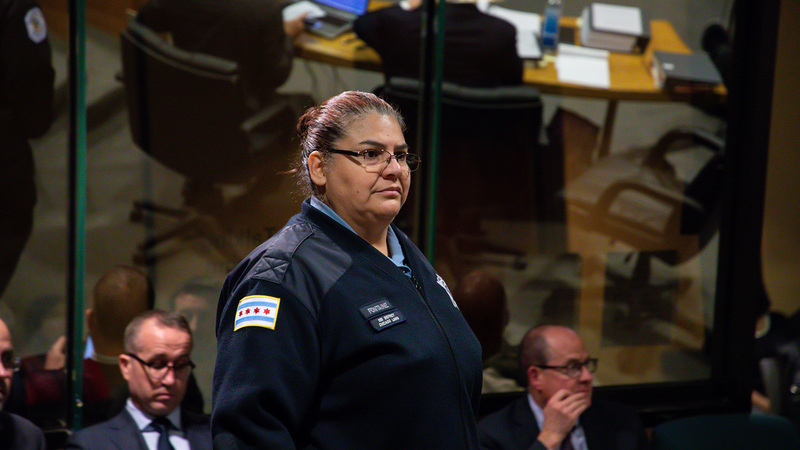 Chicago police Officer Dora Fontaine, expected to be a key witness in the state’s case, has been called to testify. “Did you witness the fatal shooting of Laquan McDonald?” special prosecutor Patricia Brown Holmes asked. Fontaine is expected to testify that Det. David March instructed her to include false information in her incident report from the scene to show Van Dyke was injured during his encounter with McDonald. March also allegedly attributed false statements to Fontaine in his own report. Defense attorneys have painted Fontaine as a liar and say her testimony will contradict what she previously told a grand jury. In her opening statements, Brown Holmes said Fontaine has been labelled a "rat" by fellow officers and told she wouldn't be safe during street patrols. Fontaine is testifying under use immunity, meaning her testimony cannot be used against her in any other criminal proceedings. Chicago police Officer Joseph McElligott and his partner, Thomas Gaffney, were the first to encounter Laquan McDonald on the night of the shooting. McElligott pursued McDonald on foot and testified he told the teen to drop his knife 25 to 30 times once he realized McDonald was armed. Those demands were ignored, and McDonald eventually used the knife to stab at Gaffney’s squad vehicle while Gaffney was seated in the driver’s seat. McElligott, who didn’t file a tactical response or an officer battery report after the encounter, was asked why he didn’t shoot McDonald. McElligott was then asked if he would have fired had he felt his life of Gaffney’s live were in danger. In cross-examining Snelling, attorneys for all three men attempted to show that ultimately, Van Dyke was justified in shooting McDonald. Walsh and Van Dyke have both claimed McDonald raised his knife at them before he was shot, an action not seen on video. At one point during his cross-examination, Walsh’s defense attorney Thomas Breen asked Snelling if he could ever see the front of McDonald’s body on video as he walks toward the officers before he is shot. “We’re not able to see what’s going on on that side, is that correct,” Breen asked. “If you’re trying to figure out exactly what occurred and exactly what Laquan McDonald did, the video has some disabilities, doesn’t it?” Breen asked. 12:46 p.m.: Was Gaffney’s Report Required? Will Fahy, who represents Gaffney, pointed out that in the officer battery report (OBR) his client filled out, he listed “4000 1/2 S. Karlov (Ave.)” as the address. That is where McDonald used a knife to pop the tire on Gaffney’s squad car, not the location where McDonald was shot. In cross-examining Snelling, Fahy argued Gaffney indeed should have filled out this OBR because it had nothing to do with McDonald’s shooting, but rather his previous encounter minutes before the shooting. He also claimed an officer could reasonably characterize McDonald as an armed assailant after the teen used his knife to stab at the squad car. In his report, Gaffney stated three officers had been battered or assaulted, though only two were present at the time of the tire incident: Gaffney and his partner. Tactical response reports (TRR) should only be filled out by police officers who actually use force against a subject. But after Van Dyke shot and killed McDonald, Van Dyke, Walsh and Gaffney each filled out these and other reports. And in doing so all three men indicated they had been battered by McDonald. CPD Sgt. Larry Snelling, a supervisor at the Chicago Police Academy and the first state witness called Wednesday, testified about when officers are required to fill out a TRR or an officer battery report (OBR) and how they are supposed to do so. In viewing dashcam video of the shooting, Snelling said it was his opinion that only Van Dyke should have filled out a TRR because he was the only one to shoot McDonald. "What I can see in the video, it appears there is one officer who discharged his weapon," Snelling testified. Prosecutors believe Walsh and Gaffney also filled out these reports in order to make it falsely appear as though they had been battered or assaulted by McDonald before his death. Jamie Kalven, an independent journalist who helped shed light on the McDonald shooting months before the city released dashcam footage of the incident to the public, was booted from court Tuesday after defense attorneys subpoenaed him and law professor Craig Futterman to testify. But the defense dropped that subpoena Wednesday, meaning Kalven would be allowed back into the courtroom. Cook County Judge Domenica Stephenson ordered Kalven to leave court over his attorney’s objection before the trial got underway Tuesday so Kalven could be maintained as a possible witness. Defense attorney James McKay on Tuesday said he had no intention of questioning Kalven about any of his sources, but stressed his testimony may be necessary if the state were to call two eyewitnesses who saw the shooting. But before Wednesday hearing got underway, McKay announced he was dropping the subpoena, clearing the way for Kalven to return to court.